Haute Coffee: For when the fancy gets to be too much. I’m all for a nice tasty beverage as fancy as you like it. But some people take it to the extreme with directions, additives and instructions on the construction of the drink. When in reality all everyone behind them in line wants to hear from them is Thank you. Not sure if you know this but I found this fun little tidbit out while researching the doodle. Haute Couture is a very specialized brand of fashion, fashion houses have to create their unique looks specifically for clients individually and fitted to them by no less than several sessions and fittings. So its only fitting that Haute Coffee is coffee crafted to be a unique experience for one singularly annoying customer. 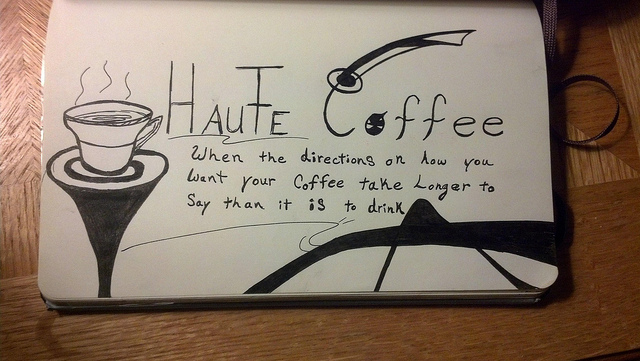 Haute Coffee: When the directions on how you want your coffee takes longer to say that it is to drink.